Jacqui (Kirk) Chapman is currently researching for her Masters in Painting at Wimbledon College of Art, University Arts London (2018/2019.) She attained a first class BA (Hons) Fine Art degree at Wirral Metropolitan College, accredited by Liverpool John Moores University (2006) followed by a Fellowship (2007). She co-founded MOSAIC, an international arts collective whilst exhibiting in the Florence Biennale (2011). International exhibitions were hosted in USA (2014) and Australia (2013). Jacqui has exhibited in all of the Liverpool Independents Biennials since 2006, as an exhibitor, curator and researcher, serving on the board (2011-2012). Locally, she supports the Williamson Art Gallery, and in 2013 co-organised the fundraising Extra-Ordinary Postcard initiative to “save” this public gallery from closure. She was a longstanding member of the Oxton Artists, working on the committee, and arranging annual exhibitions. She has been a member of Markmakers Art group for almost 10 years, the focus of this work being experimental. 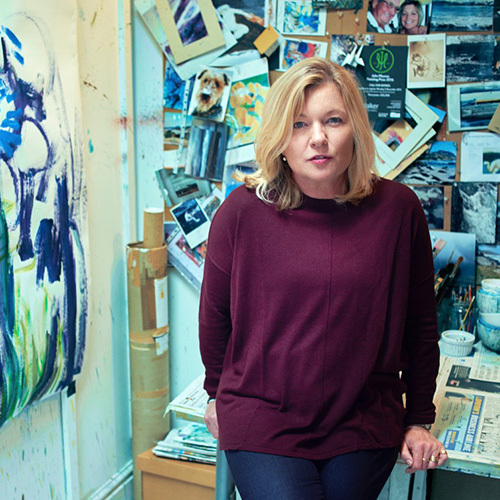 She has supported students at Wirral Metropolitan College with student talks and Wirral Grammar School’s art students with classroom workshops, offering studio visits and guidance. Prior to immigrating to the UK from South Africa (1995) and having studied Graphic Design at Johannesburg (1979) and Cape Tehnikons (1980-81), Jacqui had a successful 14 year career as an Art Director in Advertising. This culminated with being part of the Ogilvy & Mather team who delivered the A-Political campaign to ensure a free and fair election when Nelson Mandela was elected as President in 1994. Her childhood nurtured a connection with landscape, in bush farms and game reserves, and the sacred place of the Wild Coast. Her research for her Masters, is about this relationship, belonging to and separate from, her Homeland, after 23 years. The Wonder of it All : Constructed industrial and temporary botanical landscapes Liverpool Independents Biennial, The Gallery Liverpool, Liverpool. I am a professional abstract landscape painter, printmaker and bookmaker interested in the subject of transience. More than a visual experience, I paint the sensation of a specific place remembered which considers reality from a distance and includes a sense of impermanence and loss. I am interested in the materiality of paint and the significance of language implicit in its application and consistency. My experience as an immigrant from South Africa, informed my under-graduate work, which focused on the idea that identity is shaped by territory. A metaphorical, abstract painterly language developed which interpreted memory, questioned the emotive state of exile, and included film. Expanding on these ideas, particularly the effect of language during my Fellowship (2007), I explored new ways of making work using different technologies and processes. The question I asked was if photography was too exact a mnemonic to record memory. With a painter’s vocabulary, I made a short film where I drowned my old beach dress, layered images, sampled sound and projected this onto a pashmina. My large abstract paintings were about transplantation and displacement. Since 2007, my work has continued to reflect my relationship with landscape, questioning the significance of this within a broader context. I worked with international Cuban artists and poets in an exhibition I curated about exile, No Voice, (Liverpool Independents Biennial 2012), and a two-person exhibition, The Wonder Of It All (2016), where we questioned how human behaviour uses the world’s natural resources, from China’s recycling to the excess of “fake” nature created by industrial landscapes and contemporary pop-up flower shows. I will be studying MA Painting at Wimbledon College of Arts, University Arts London in 2018/2019. My research includes the importance of homeland; the effect personal and collective memory has on culture and my changing relationship with South Africa, 23 years since immigrating to the UK. Warrington Museum and Art Gallery, Warrington.